First, the facts of the new polls. Quinnipiac polled 927 Republican voters, landline and mobile, with an MoE of 3.2. CBS polled 324 Republican voters, landline and mobile, for an MoE of 6. In the two weeks since the last CBS poll, Perry went from 23 to 12, from first place to third. Taking his place, Romney gained one point and Cain gained 12 to tie the two at 17. This poll did not include non-candidates. One interesting tidbit is CBS says 58% of GOP voters are watching the debates. Yes, they matter. The Quinnipiac poll did include Sarah Palin, far behind the leaders at 9. 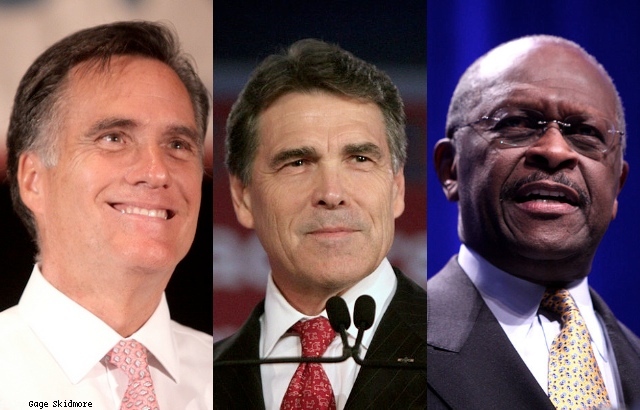 Romney led at 22, Cain finished in second at 17, and Perry fell to third at 14. The poll shows a huge gender gap. Perry is even (13 men/14 women) but Romney (19/24) and Cain (23/10) are lopsided. Cain is in fourth place in the poll among GOP women, behind Romney, Perry, and Palin. Alright, time to do some math. For easy reference, between Romney/Cain/Perry CBS had 17/17/12 (MoE 6), Quinnipiac had 22/17/14 (MoE 3.2), ABC had 20/15/15 (MoE about 6), and Fox had 23/17/19 (MoE 5). If I take the probability from each poll and average them, I show a 57% chance that Cain leads Perry at this moment. As for Mitt Romney, I give him a 67% chance of leading Cain, and a 72% chance of leading Perry. Romney clearly leads, and Cain is just ahead of Perry for second place nationally at this time.